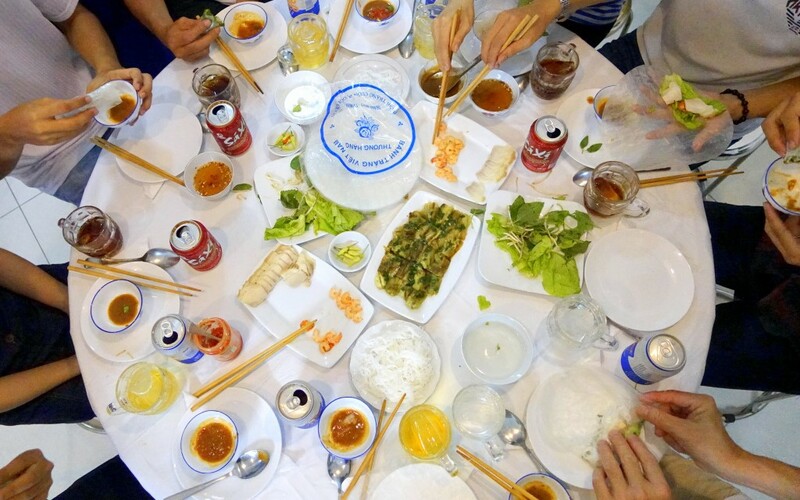 When I visited Vietnam, specifically Ho Chi Minh City, for the very first time last year, I totally binged on phở (rice noodles in broth,) bánh cuốn (steamed rice rolls,) and gỏi cuốn (spring rolls.) I couldn't help myself; they were ubiquitous throughout the city - in restaurants, street stalls, food carts and markets, each one tastier than the last. 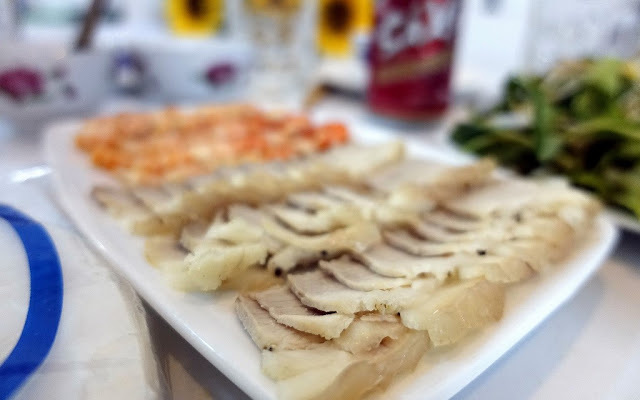 But as I was trawling the online food sites for ever more recommendations, I came across one that extolled the virtues of eating with a local, honest to goodness, Vietnamese family, and my curiosity got the better of me. I mean, in a city bursting with over 8 million people, I figured there must be a plethora of fresh, made-to-order, authentic family fare to which visiting foodies may rarely have access beyond the usual dining haunts. 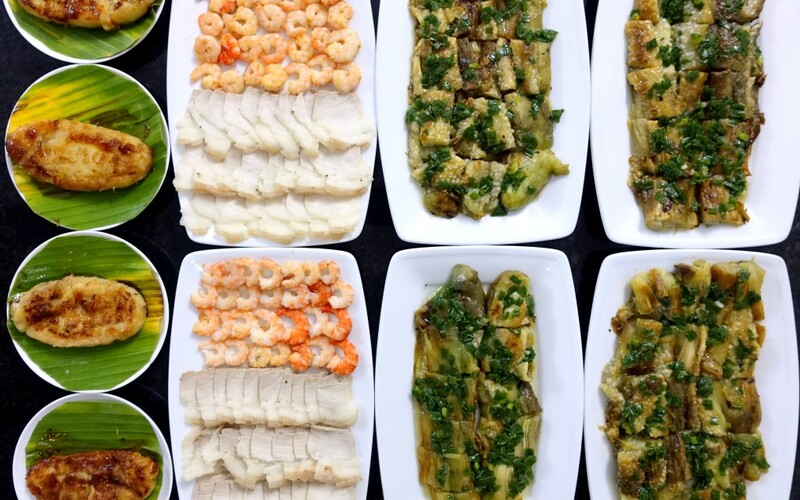 Jointly run by local chef Hai (who has his own restaurant Dong Hua Xuan) and his partner Joe, the Eating Saigon website is full of information on the best eating spots in the capital, along with a helpful glossary of the most popular types of Vietnamese dishes. One section titled Eat With A Local Saigon Family! 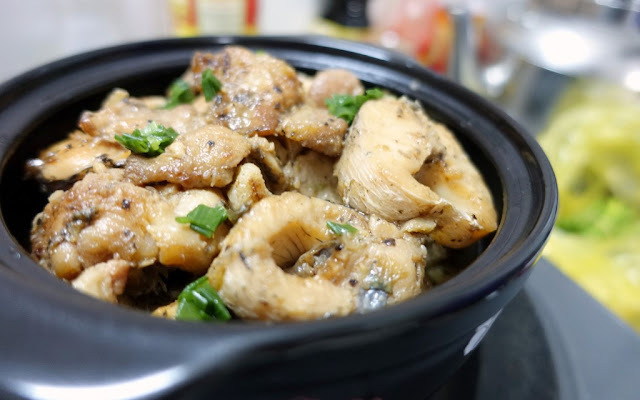 features three hosts who welcome guests into their home to eat their traditional dishes, generally with their own family members. Once a host is selected, reservations may be made online, and you're well on your way to some home-cooked goodness. Enroute to our dinner and battling through this traffic madness which everyone seems to take as par for the course of living in downtown HCMC. 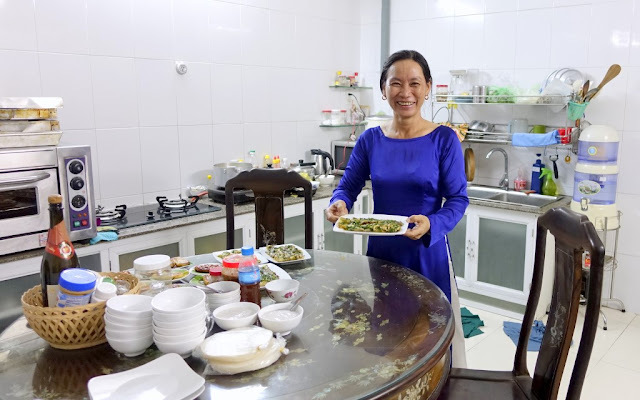 The first host I picked had to bow out due to medical reasons, so Joe quickly and apologetically arranged for replacement host Dậng Thi Nhật Minh (pictured below) to cook and dine with us. 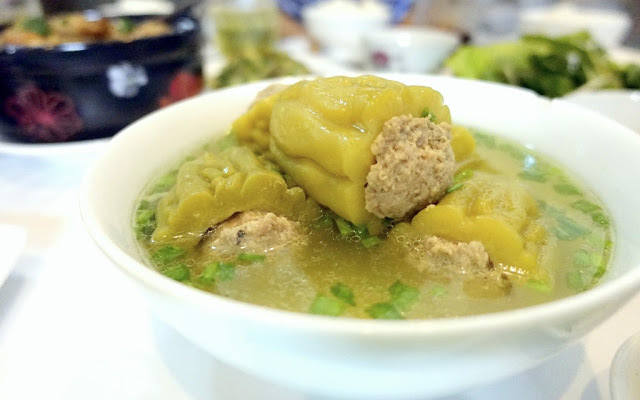 Her home is set within a warren of streets in the Bình Tân district which was a bit of a challenge to find, even with Google map directions, a helpful hotel concierge and an eager taxi driver. 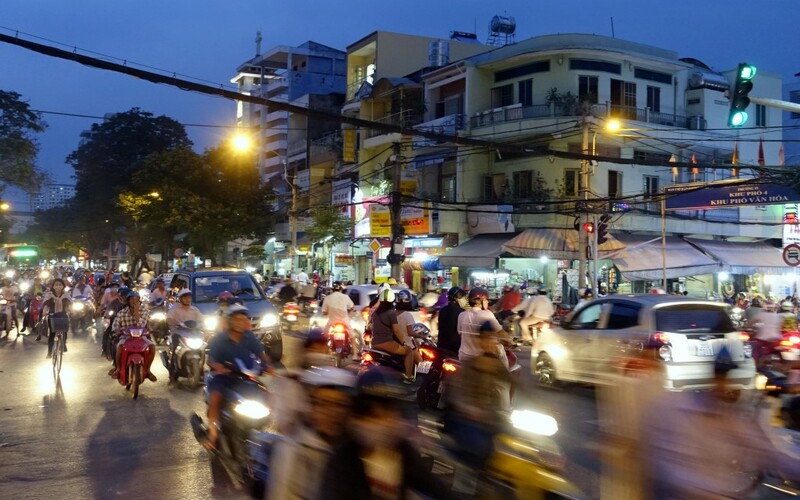 As the crow flies, it's less than a 10 minute cab ride from the main downtown core of Saigon, but taking the traffic into account, we got there in about 20 minutes. We arrived to find Minh making the last preparations in her large open kitchen. She shooed away our offers to help and we were left to be entertained by her multiple and extended family members, some of whom were only too eager to practice their spoken English with us. In particular, Minh's son Thành (or James, as he preferred to be called) took the mantle of being the family spokesperson, introducing us to the rest of his family, chatting about his current school courses and asking about our impressions of his city. 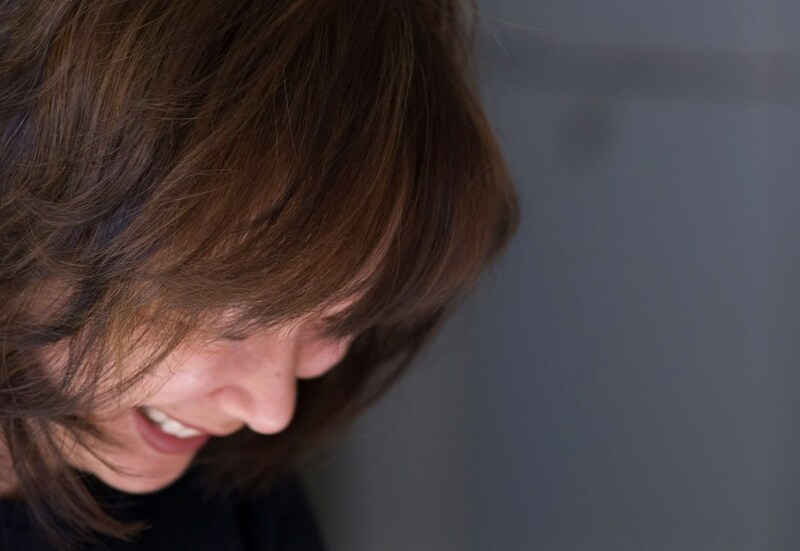 Minh taking a brief break from the kitchen to share a laugh with her two sons, nephew and husband. James is the one in the purple checked shirt. Eating Saigon provided us with an English translator, who in turn, brought a young apprentice in tow. 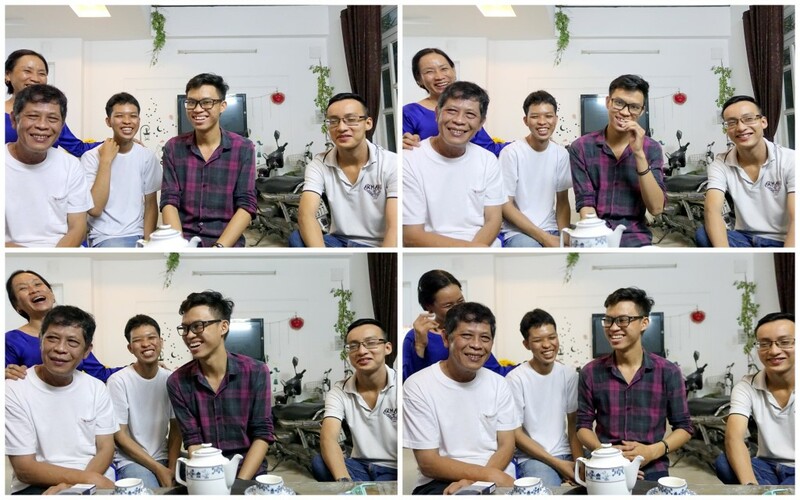 The dinner turned out to be a giggly, good natured feast with Minh, her husband Thanh Binh, sons James and Quân, as well as her sister Thang Long and her family. All 11 of us sat comfortably around the dining table which had a direct view of the open kitchen and the parade of dishes that just kept coming throughout the evening. 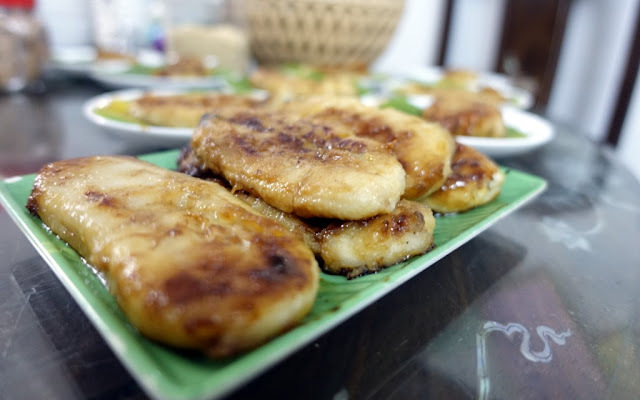 Dessert came in the delicious form of pan-fried banana fritters, with gratuitous dollops of coconut milk and tapioca pearls (sago) and topped with fine sesame seeds. 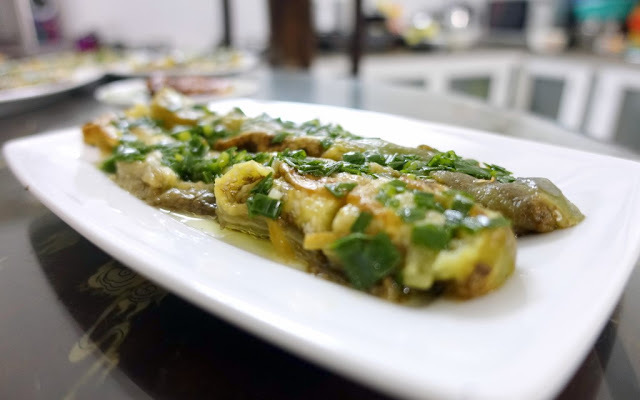 Cold appetizer of braised aubergine / eggplant drizzled with oil and garnished with scallion. Braised bittergourd stuffed with minced pork in a clear broth with spring onions. The gang's all here. 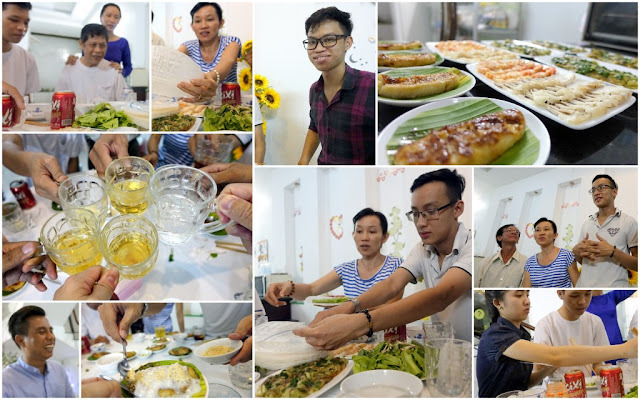 By the way, both Minh and her sister Thang Long are cooking lecturers at the Ly Tu Trong Technical College which meant that we totally lucked out in these home-cooked stakes by having two pros feed us so well. 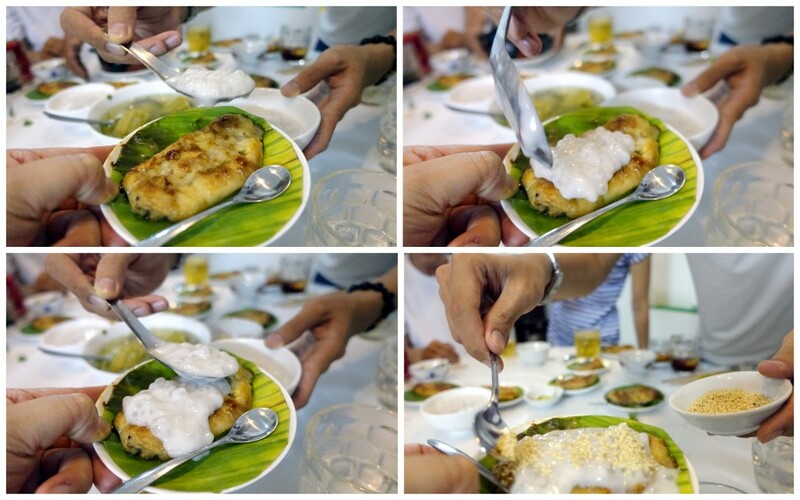 My banana fritter being doused with generous helpings of coconut milk. ﻿﻿﻿﻿﻿﻿﻿﻿My verdict is that this event was an adventure that nicely complemented our desire to experience, and eat, locally, as much as we could in the short time we were in HCMC. Relatively speaking, the cost per person at USD24 is on the high side (the same amount would net a nice dinner at a swanky restaurant in the city,) but honestly, it's a small price to pay to be accepted into someone's home and family, and partaking in their local home-cooked dishes deftly made with equal measures of care and warmth. Weekdays: 5:00 – 8:00 p.m.